I wasn't going to post this yet, but I just love it too much not to share. The photo doesn't do it justice. This is a tag we will be making in my upcoming "Very Merry Bags & Tags" class. I just love how it turned out! The Big Shot and several framelits feature prominently in this tag design. The background was cut using the Apothecary Accents framelits; the leaves using Secret Garden framelits and the Woodgrain embossing folder lends texture to the background. 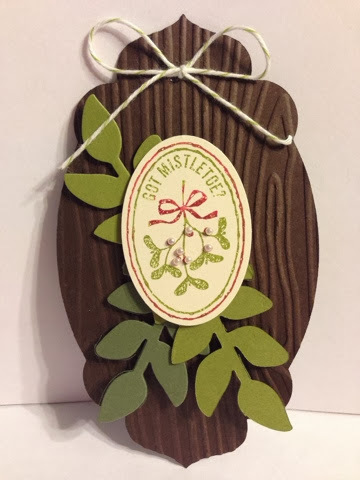 The image is stamped using Stampin' Write Markers and the mistletoe berries are topped with our basic pearls. Don't you think this tag would look beautiful upon your hard-thought gifts? To order the supplies listed to duplicate this tag, or any other supplies, simply send me an email, call me at 289-280-0304 or shop my online store!